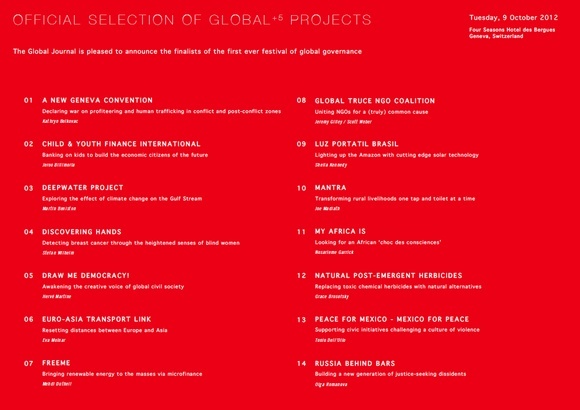 The Global Journal is honored to announce its 19 unique and innovative projects for the Global+5, the first ever festival of global governance on 9 October 2012 at the Four Seasons Hôtel des Bergues. These diverse and exciting projects range from addressing democracy and global governance to sustainable competiveness and energy security. They have the potential to stimulate innovation and drive enthusiasm and support from stakeholders regarding some of the most pressing global challenges for the next five years. Detailed projects are all available on the GLOBAL+5 photo page.